India has developed one of the largest domestic communication satellite system, known as Indian National Satellite or INSAT system, in the Asia Pacific region over last 2 or 3 decades. This system, established in 1983, presently comprises of 8 satellites namely INSAT-3A, INSAT-3C, INSAT-3E, INSAT-4A, INSAT-4B, INSAT-4CR, GSAT-8 and GSAT-12. This system at present provides 168 transponders, (A transponder is a wireless communications device that picks up and automatically responds to an incoming signal. The term is formed by combination of two words, transmitter and responder.) for various applications like phone and Internet broadband connections, public and private telephone and television transmissions and GPS or Geo positioning system applications. This capacity is proving to be totally inadequate as India is forced to lease additional 95 foreign transponders to just meet the domestic demand. Work was taken up by Indian Space and research organization, to fill up this demand supply gap to the extent possible by building the heaviest satellite named as GSAT 10. This satellite weighing 3.4 tons or 3400 Kg would carry as many as 30 transponders, besides 2 transponders that would augment the GPS system. The useful part pf the electro-magnetic waves spectrum, used by all radio communication devices, actually extends from few hundred meters wavelength at one end to Ultra Violet waves at the other end. Beyond this, we have the X rays and the Gamma rays. The radio waves at the lower end of the spectrum, move along the surface of earth and require large sized antenna for reception and transmission of radio signals, making them suitable for direct radio broadcasts. The higher end waves, require small sized antennas and can be used only for line of sight communications. The entire radio waves spectrum is divided in what is called as bands. For radio transmission we have medium and short waves bands. As we go towards lower and lower wave lengths, we have bands denoted as High Frequency or HF band followed by Very High Frequency VHF and Ultra High frequency or UHF bands used mainly for terrestrial TV transmissions or for cable TV transmissions. Further down the wavelength spectrum, shorter waves, usually called as microwaves, are grouped in bands denoted as L,S,C,X, Ku, K, Ka, Q bands. Out of these microwave bands, S, C and Ku bands are being used at present for satellite communications. All early satellites, used S band but this requires a larger dish antenna for reception of signals and is not being used now. The Ku band is now used by all DTH TV operators and thousands of VSAT operators who provide phone and Internet broadband connections. Public and private telephone and television providers now use the C band. 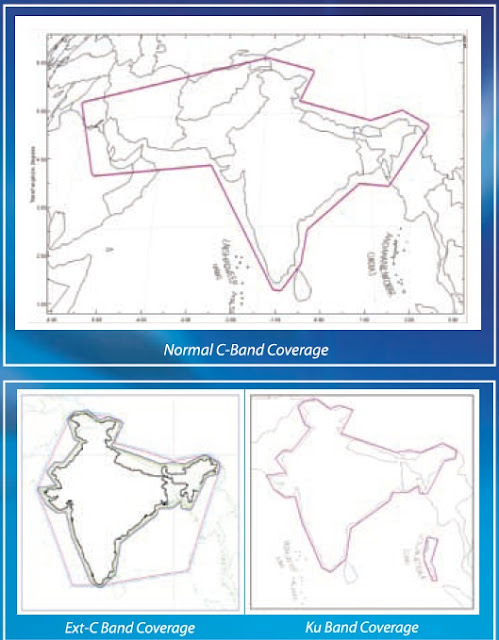 Considering the needs of the users, GSAT 10 satellite provides 12 Ku band transponders, 12 C band transponders and 6 extended C band transponders. ISRO says that the Ku band transponders would have a foot print over Indian mainland and Andaman-Nicobar islands, whereas C band transponders would have a foot print over Indian mainland and west Asia. All transponders would have 36 MHz bandwidth. As I mentioned above, the radio waves in the microwave region, only travel along line of sight, or in other words, the sender and receiver must always see each other. It becomes necessary for a communication satellite like GSAT 10 to be in the visibility of the foot print area all the time. This is achieved by keeping the satellite in what is called as Geosynchronous Orbit. To place a satellite in such an orbit, all we need to do, is to raise it to an altitude of 35786 Km from the ground. At this altitude, a satellite moves in a orbit around the earth at the same velocity as earth's rotational velocity. This makes the satellite permanently visible in the foot print area. 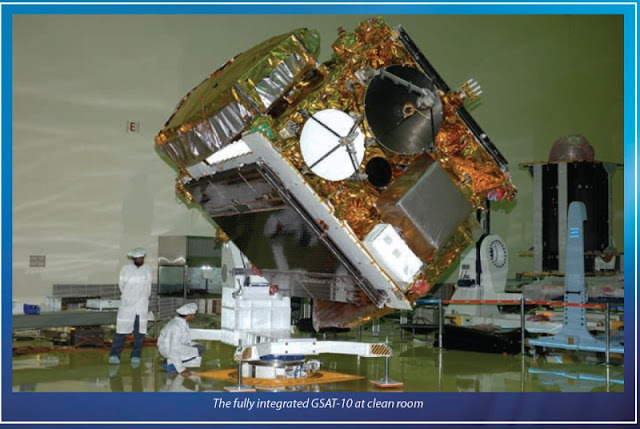 GSAT 10 was launched on 28 September 2012 in an elliptic Geosynchronous transfer orbit. 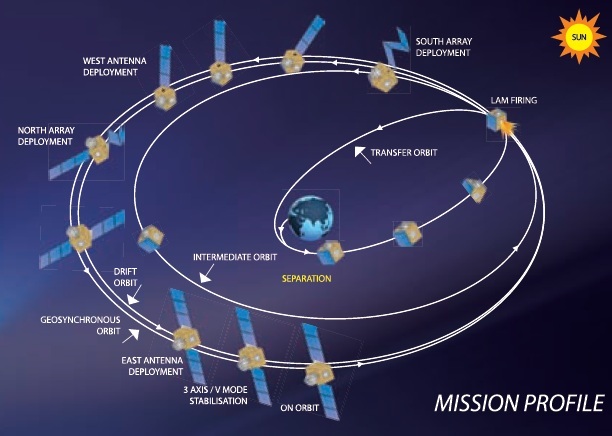 In the next few days its orbit would be raised from the elliptical orbit into a circular orbit with 24-hour rotation around the Earth and fixed at 83 degrees east slot over the Indian region at approximately 36,000 km above ground in the company of two other Indian satellites INSAT 4 and GSAT 12 . Fabricating a satellite of such complexity, is no doubt a great achievement and ISRO must be rightfully proud of its achievement. "Fabricating a satellite of such complexity, is no doubt a great achievement and ISRO must be rightfully proud of its achievement. " Very true. Congratulations to people who made it possible. It is so heartening to read good news about India.